Short modules of 2-5 days which may be combined. Met on arrival and transfer to your hotel. Balance of the day at leisure. This fantastic Eco tour begins at your hotel and heads westwards across the coastal plain to the Great Dividing Range of Australia. It is here we leave the average Blue Mountains tourist behind d and enter the National Park to unlock a piece of Australia you would never have known existed. We visit an ancient Aboriginal site and outstanding lookouts; examine rock formations and the unusual plants and wildlife that abound the area. From the quaint little village of Leura we skirt around Cliff Drive to Katoomba where you will find yourself looking out over the magnificent Jamieson Valley (Australia’s Grand Canyon) and the Three Sisters. We enjoy a delicious barbecue lunch including a selection of fine Australian wines with a cheese platter under the canopy of the Australian bush. Before returning to Sydney we drop into a hidden valley where we roam the area seeking out the many kangaroos that graze in the wild (conditions permitting). Reluctantly we leave the National Park for return to our hotel passing through the Olympic 2000 site on route. 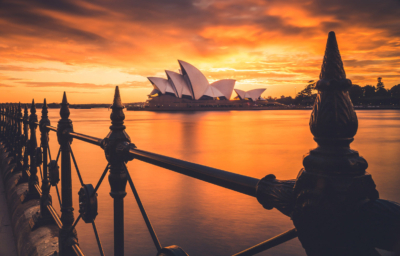 Cruise the world’s most beautiful harbour and enjoy a delicious buffet lunch as you pass the Opera House, Sydney Harbour Bridge and bays. This evening a special treat – an Evening at Sydney’s world famous Opera House with guided tour, dinner and selected performance. Transfers to and from the Opera House included. Transfer to airport for onward or homebound flight. Visit the Great Barrier Reef, a true wonder of the world, to see coral formations, a kaleidoscope of colour. The lagoon offers swimming, snorkeling or scuba diving, presentation by a marine biologist, semi-submersible reef viewing, tropical buffet lunch, helicopter flight for spectacular Reef views. hotel in the late afternoon. This morning discover the diversity of this multi-cultural city on this tour. See historical buildings, beautiful gardens, and shopping areas famous for their restaurants and fashion. Melbourne is the sporting city. Melbournians are passionate about their Aussie Rules footy and almost all sports known to mankind. diversity is expressed in the food and fashion centers. Walk along the shopping strips of up-market traditional Toorak, funky Chapel Street Prahran or culturally Vietnamese Bridge Street Richmond. Markets where huge range of fresh produce, exotic foods, clothing and artifacts are sold amidst a chorus of stall holders. Note: Queen Victoria Markets are not open Mon/Wed. This evening enjoy dinner on board the Colonial Tramcar restaurant. As it cruises the scenic streets of Melbourne, diners can enjoy fine cuisine and drink the very best of Australian wines. From Melbourne city centre, travel through a cross section of suburbs to the eucalypt forests of Warrandyte. Enjoy a short stroll with your guide with a chance to see the diverse bird life and koalas that inhabit the forest. Your guide will bring the natural history of this region to life. A short drive to a nearby forest area will enable you the chance to see wild kangaroos relaxing in their natural habitat. Drive downward into the rich greenness of Yarra Valley. Over 50 wineries are established in the valley, varying in size from small family vineyards to large international establishments. We visit historic wineries for wine tastings and browse at a display of fine artwork. Lunch will be at the award winning Eyton Restaurant at Rochford Winery. Enjoy superb food looking onto the vineyards. After lunch, visit a boutique winery for further wine tastings. Drive through the valley to the cool and inviting forests of the Dandenong Ranges. The tall wet eucalypt forests feature the large mountain ash trees and verdant canopy of tree ferns. A short walk with your guide takes you along a fern gully stream deep into the forest. The mimicking calls of the lyrebird can sometimes be heard. Return to city centre through the established suburbs of South Eastern Melbourne. Melbourne inland, arriving late evening. The Blowhole and the ruggedly beautiful coastline around Devil’s Kitchen. Rejoining the vehicle after a short stroll we continue onto Port Arthur. The settlement was created to put fear and hatred into the minds of those unfortunate enough to be sent there. Visit the ruins of the settlement whilst hearing tales of the hardships suffered by the convicts. We board a short cruise around the harbour, and enjoy a light lunch before re-boarding our vehicle for Hobart. This historic journey takes us northwards across the Tasman bridge to the quaint village of Richmond. Here we visit Australia’s oldest bridge, the Jail St John’s and St Luke’s Churches. Rejoining the vehicle we continue onto Ross, Tasmania’s finest heritage village, We visit the Wool centre where we can follow the history of the production of fine wool, as well as an historical exhibit on the history of the area. Ross was also home to the Female factory where convict women were put to work sewing and laundering garments. Some 12,000 women were transported over the 50 year convict era. From Ross it is off to Campbelltown and the forest areas toward the coast at Swansea. We call in at Kate’s Berry Farm with magnificent views across the bay. Maybe enjoy a local made ice-cream or taste the home made jams. Continuing down the coast we are met with outstanding views of the coastline and winter forest country as we journey back to Hobart. Departure transfer to airport for onward or homebound flight. Met on arrival and transfer to hotel. This afternoon a tour of Alice visiting Anzac Hill, the Old Telegraph Station, Royal Flying Doctor Base supporting life in the Outback, before drop off at hotel. Tonight the Red Centre Dreaming – dinner and show with authentic, traditional performance featuring dancing weaponry, interaction, didgeridoo playing and cultural history. Enjoy a glass of sparkling wine on arrival followed by a three course dinner accompanied by wine and soft drink served with the main course. ‘Red Centre Dreaming’ is an interactive and unique entertainment in a ruggedly beautiful bushland setting. A hot air balloon flight this morning, over the rugged McDonnell ranges, seeing wildlife or the vast open spinifex plains, followed by a gourmet breakfast. The day is then free for you to enjoy Alice on your own. Tonight, Take a Camel to Dinner! Transfer to meet your camels, take a leisurely ride past magnificent gums trees on your way to the Camel Farm. Visit the museum before dinner, served with homemade bread and salads, Australian wine or beer. ancestors. Finally visit the remarkable Uluru Kata Tjuta Cultural Centre before returning to hotel. Picnic breakfast on tour included. Tonight, the Sounds of Silence tour for dinner under the stars – an experience not to be missed! Note: tour departs on Wed and Sat only. This morning our journey takes us to Litchfield National Park via the township of Batchelor. We visit the beautiful Wangi Falls and Tolmer Falls lookout two of the many waterfalls cascading from the Tabletop Ranges. Perhaps a swim in the plunge pool at the base of Wangi, or a walk to explore the surrounding monsoon rainforest. After lunch we travel on to Florence Falls, perhaps the prettiest of them all. There is also the opportunity to view the unique magnetic termite mounds before we leave the National Park and continue on to Darwin. Breakfast and lunch on this day included. Accommodation: Darwin (1 night). Note: in Dec-Mar (wet season), some areas become inaccessible due to flooding, so alternative areas will be visited. Transfer to airport for onward or homebound flights.